After a career as a Calligrapher and Illuminator textiles stole my heart . I had always enjoyed decorative sewing but it was the need to keep creating whilst my daughter was tiny that led me to a more serious interest in embroidery and other aspects of textile art..
Over the years I achieved City and Guilds, NCFE and ‘A’ level qualifications in Embroidery and Design and then in 2011 I fulfilled my dream and graduated with a BA(Hons) degree in Embroidery from Middlesex University, London, UK . During the degree studies I found a passion to create pieces that would combine both concept and the best of technique thus finding a home in both the worlds of high craft and fine art and hopefully destroy the divide.In 2001 I formed (and still lead) the exhibiting group Material Girls and in 2008 I founded the Eastern Region Textile Forum – an association of Textile Artists based in the East of England. 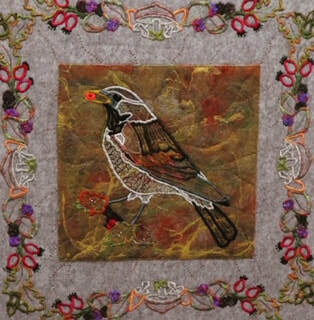 ‘Having explored a variety of textile techniques my current practice is to use fibre and hand embroidery. I have always liked making things. As a child my mum taught me to knit, crochet and embroider by hand. When I got older she also taught me to make my own clothes. I joined the local branch of the Embroiderers Guild and recently claimed my 25 year membership badge. I have completed Part 1 of City and Guilds Creative Embroidery and have an HNC in Design Crafts. I have attended numerous courses and workshops over the years covering a range of mixed media and textile subjects. My favourite techniques involve surface decoration and stitch. I'm always interested in furthering my skills and in the last few years have gained a City and Guilds Patchwork and Quilting Cert. taught by Janice Gunner. ‘My earliest childhood memories include turning the handle on Gran’s Singer sewing machine, as she made my clothes. Having stitched/embroidered/crocheted most of my life, redundancy from a ‘proper’ job prompted a now or never opportunity for formal studies by way of City and Guilds Creative Embroidery (Parts I and II). The variety of techniques studied furthered my interests to obtain a City and Guilds in Paper Art and an NCFE Advanced Certificate in Paper Art. These two passions combine, enjoying the challenges of stitching on paper be that by hand or machine. I have made books for almost 40 years, intrigued by construction methods and presentation. I have been a Member of my local Embroiderers’ Guild Branch for over 25 years, and have held the role of IT Rep since the inception of the position. All of the above has led to solo exhibitions, collaborative projects and brought me to The Material Girls. As a child I loved playing around with leftover fabric and wool from my mothers clothesmaking. I made dolls clothes, soft toys and later crochet and knitted items. Today I only feel fulfilled when I have scissors or a needle and thread in my hands I love the creative process and am a 'jack of all trades' having taught a variety of textile processes in Adult Education for 18 years.At the moment I am into dollmaking, anything vintage and recycling, but then as a Gemini next week it could be something completely different!. The last 3 years has been spent making things for my beautiful twin grand daughters,dolls clothes, quilts, jumpers amd dressing up items but now is the time to be creative and do something for ME. 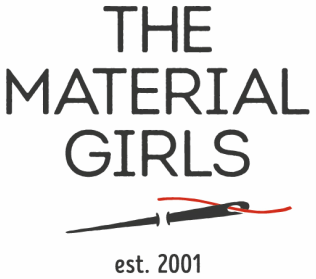 I was delighted to be invited to join The Material Girls, I enjoy working with such a talented and diverse group. Always up for a challenge, I have participated in several exhibitions and thoroughly enjoyed the creative process and being able to showcase my work. My earliest recollection of sewing is aged about 6 or 7, decorating tray cloths with embroidery stitches, then making an appliquéd tea cosy and my parents buying me my own small sewing machine. I was taught by nuns, but sewing and embroidery skills were also abundant within the family at that time. Since then I’ve tried most things - dolls cloths, my own clothes, wedding and bridesmaid dresses, clothes for my daughter, soft furnishings etc and in the mid 1990s I started to dabble in patchwork and quilting. The opportunity to teach patchwork cropped up in 2010 following redundancy from a 32+ year career in IT. This lead to more teaching for shops and craft studios, which I still do, a three year stint teaching in the adult community learning sector and, more recently, starting my own classes in 2017. I completed the City & Guilds Diploma in Patchwork and Quilting in 2017 taught by Janice Gunner. Looking for new challenges since completing the C&G Diploma, I’m delighted to have been given the opportunity to join The Material Girls. From a very early age I was taught to knit and sew first by mum and then at school. I have always enjoyed making things and would watch and help my mum make our clothes, fancy dress and ballet show costumes. My dad was also very practical and would make and repair items. I enjoy embroidery and making items from repurposed fabric. I have studied ceramics at a local adult education Centre for many years. More recently, after finishing full time work, I completed my City and Guilds Certificate in patchwork and quilting, taught by Janice Gunner, a design for stitch course run by Alex Waylett and have been able to indulge myself in a range of mixed media and textile workshops.